66 MARCH 2015 COATINGSPROMAG.COM Never Again A grid of straight lines telegraphed through to the epoxy coating and luxury vinyl plank flooring. 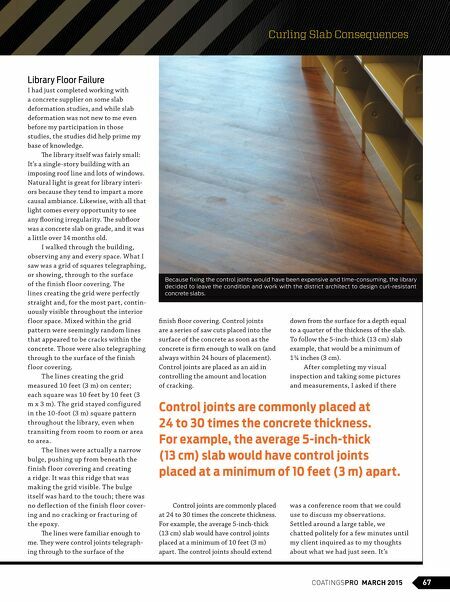 By Roland A. Vierra, President and CEO of Flooring Forensics Photos courtesy of the author The Case of the Curling Slab A long-time client asked me to evaluate conditions within a new library building. Tere were some unusual manifestations being seen on the small amount of epoxy coating as well as on the luxury vinyl plank fooring, and no one could explain them. Meeting in the lobby area was my client, the facility manager for the public agency running the librar y, a representative from the general contractor, and, of course, the f loor covering contractor. T he more people present, the more these ty pes of site inspections become a dog-and-pony show. A ll I really want to do is walk around and look quietly; however, when there's a group tag ging along, there's always the chance of being distracted by various questions and the method in which the questions are asked (usually in such a way as to sug gest that someone other than the questioner is to blame or as a show of superior knowledge about what we're looking at). Most of the time, I'm able to disguise my annoyance by play ing the part of an old, impatient geezer while at the same time tr y ing to focus on my obser vations. A lmost w ithout exception, these initial evaluations do not involve removing any part of the f loor cover- ing. T hese preliminar y evaluations are used to set up a working hy poth- esis, meaning "this is what I think happened and this is how I can prove it." Most of the time, the report gener- ated by this simple evaluation is all that's ever done. T he condition being evaluated is common (at least to me), and whatever objections the group has to my initial conclusions are minor and non-persuasive. T his was the case w ith the librar y f loor; no intrusive tests were necessar y. But even still, this case was fun. 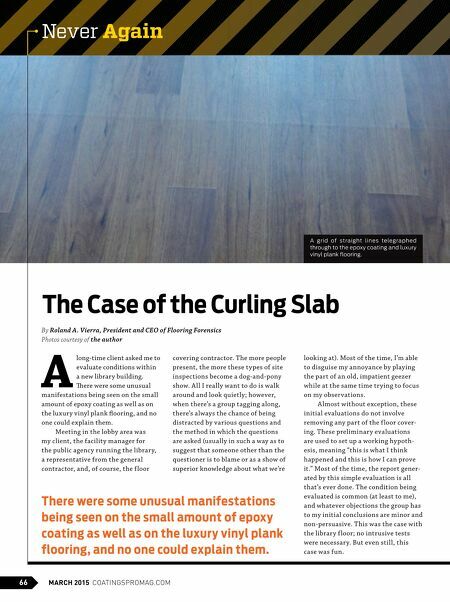 There were some unusual manifestations being seen on the small amount of epoxy coating as well as on the luxur y vinyl plank flooring, and no one could explain them.